The Grind Line: Will Steve Yzerman Be Back & What Would He Change? The Grind Line: Will Yzerman Be Back & What Would He Change? Ever since Steve Yzerman suddenly resigned from his post as general manager of the Tampa Bay Lightning, Detroit Red Wings fans have been anxiously waiting to see if the king would return to Detroit. Having spent his entire playing career with the Red Wings and blazing an untouchable trail to the Hall of Fame, there are many who would welcome him back with open arms. Though Yzerman hasn’t confirmed a return to Motown, several viable sources think it to be inevitable. They won’t find anyone complaining. BREAKING: Steve Yzerman has stepped down as GM of the @tblightning. Julien Brisebois is the new GM of the Lightning, per @bobmckenzietsn. Wing-nuts are unhappy with the state of the development, mainly its frontrunners. General manager Ken Holland is rarely anyone’s favorite, and head coach Jeff Blashill has been in the hot seat more than once. 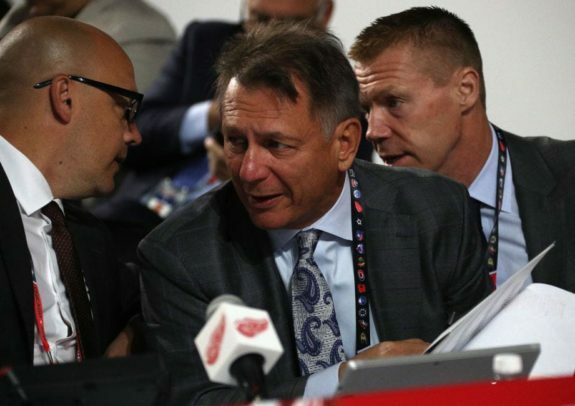 Though the Red Wings seem to be on an upswing, the sudden availability of Yzerman, his comings and goings with Red Wings management, and close friends of his stirring the pot are all spawning some intriguing ideas. Much like his early years as a player, Yzerman could very well be exactly what the team needs. So, will Yzerman return? Will the captain of dream teams gone by be the human-defibrillator for the Red Wings? The Grind Line picks that apart this week. We also wanted to take a look at what he will do if he comes back. Additionally, how will fans react? I’m beginning to believe it very likely that Yzerman will come back to Detroit. Though the wheels started turning after he announced his resignation with Tampa Bay, they were confirmed (for me anyway) when I had seen him with Ken Holland and Kris Draper in Muskegon, Michigan. The Muskegon Lumberjacks were playing against the USA Development Program team, where the much sought-after Jack Hughes currently plays. If he were to return, I think it’d be the equivalent of pulling the rug out from under the team. Metaphorically speaking, that rug is in tatters anyway, but I believe Yzerman would be tasked with the unhappy duty of replacing and trading some familiar faces—some that people have come to love. Many wouldn’t blink if Holland and Blashill were released; however, underperforming and cost-sucking contracts would also be released. Niklas Kronwall will likely hang up the skates following his countryman, Henrik Zetterberg, but others I can see being traded off. Justin Abdelkader and Frans Nielsen would be potential trades come to the end of the 2019-20 season and beginning of the 2020-21 season, along with Danny DeKeyser. Pushing their mid-to-late 30s, their releases would not only clear up quite a bit of cap space, but would also enable several skaters waiting with the Grand Rapids Griffins to make the jump, like young stud Filip Zadina. Yzerman understands the demands of the NHL and how that affects a young skater, being so young himself when his career began. I think he would drive the youth movement that Holland has begun through the drafts. Regardless of who the general manager is, there will always be points that the fanbase can’t agree on. In regards to the Red Wings, I believe the initial trades, replacements, and front-office adjustments would likely shock many and maybe even upset a few. I think most fans, however, would view much like a band-aid being torn off—a little pain and discomfort, but it won’t last long. Yzerman has a proven track record of hockey smarts on the ice and in the GM seat, so I think he would be readily embraced by the Detroit community. Should Yzerman fulfill the dreams of countless Red Wings fans and return to the organization this summer, he’ll naturally take control of the underappreciated rebuild job Holland has started. With said control, Yzerman will be tasked with once again returning the franchise to glory as he did during his playing years. There’s a lot he could do immediately to make the team his own: replace Blashill, whose job seems safe for now, trade a hefty contract (or two), sign a big free agent, draft a franchise player, or even sign a big free agent. But the best thing he can do is take a step back in spending. Holland ran the team near the cap ceiling since the beginning of the salary cap era in 2005-06. It had been justified given the Red Wings’ success during the time, but the team was noticeably trending downward. Holland made questionable trades and handed out regrettable contracts to make the pretender look like a contender. Now, with a handful of expiring contracts, Yzerman will treat the Red Wings like a true rebuilding franchise by saving cap space for the brightening future. Thomas Vanek ($3 million), Gustav Nyquist ($4.75 million), Jimmy Howard ($5.29 million), and Niklas Kronwall ($4.75 million) represent the largest expiring deals, combining to offer Detroit approximately $17.79 million in cap space. Add in the smaller expiring deals and no noteworthy raise to be handed out, and Yzerman will have roughly $20M in cap room to not use. The honest Red Wings fans will appreciate and understand the move and what it means for the future. A team shouldn’t be maxed out until it garners true contender status. Once Yzerman’s contract with Tampa Bay expires this spring, I expect him to take time off from hockey before deciding what he wants to do next. While it would be amazing to see Yzerman leading the Red Wings once again, he deserves some “me time”. 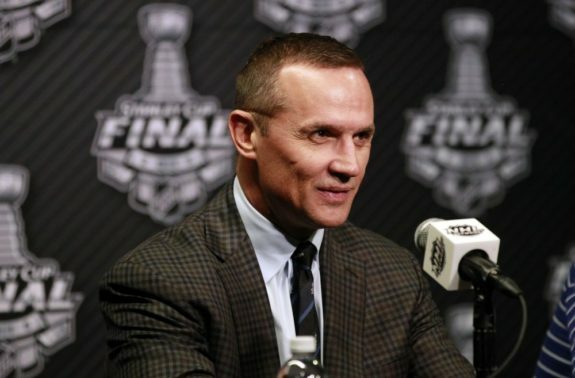 Dating back to juniors, Yzerman has been involved in long hockey seasons for almost 40 years. That’s half a lifetime of nearly constant hockey. And now that his kids are growing up, it might make the most sense in his mind to enjoy family life for an extended amount of time. At some point, Yzerman and the Red Wings will be reunited. I don’t think that will happen immediately after his contract with Tampa Bay expires, though. Maybe a year later—maybe two. He’s a methodical person and will do what’s right for his family.